Hello everyone, how was your week? I hope it was better than mine. This stupid cold/allergies or whatever it is lulled me into a false sense of security earlier this week, only to knock me flat on Wednesday. Guess I tried to do too much or something. It wouldn’t have been so bad if it wasn’t for the sinus headaches, those are awful! But now things seem to be on the upswing again, and this time I’m cautiously moving forward. I don’t want to overdo it and be sick for the long weekend. Speaking of the long weekend, this is just one example of why I want to get my routines revamped. Long weekends, no school days, school functions …. all of them are things I need to be better prepared for when it comes to how I structure my routine, because they usually don’t follow the norm. On Tuesday I shared my first step in this process, making up the Master List. As I mentioned, this was just a list of the things that I do daily and weekly that keep our lives running smoothly. I was pleasantly surprised that I didn’t fill the page. I was worried that it was going to turn into a list of epic proportions. I said I would share it with you and here it is. I’ll break it down into categories for you. Personal Grooming: wash face, brush teeth, shower, help Liam do all of that, etc…. Meal Prep: making dinner, breakfast, lunch, baking snacks and bread etc …. Hobbies and Interests: all things blog related, time to foster interests that the boys have, etc…. So now you have a basic idea of what I put on the list. I’m sure your list will be different from mine. I’ve tried to keep our family schedule simple and to resist the temptation to add to it. This is what works for our family, but maybe it doesn’t work for you, that’s ok, you’re list might be longer than mine. Your list might be shorter. The idea is to see on paper all the things you need to accomplish for daily life to run smoothly. Once you have your list done, you’re ready to move on. The next step is to prioritize your list. This step will either be super easy for you, super hard, or something in between. For myself, this is one of the harder steps because if I planned my days based solely on what was most important to me, many of the things that need to get done for our life to run smoothly, simply wouldn’t. So, when I say prioritize, I don’t simply mean list them from what’s most important to you, to least important. I mean, lets take a little time and really think about this. To help, I’ve created the following printable. Each box represents one category, within the categories you have your items that you need to do. Categories 1 and 2 are smaller boxes, because these are kind of like the “most important” to do’s, or the “must get done” items. Category three is larger because the rest of your list will go into that one. Categories 4 and 5 are for the extras, five being the largest because this is for the little things. So here’s how I broke it all down. This category is for the things that we have little or no control over. The are the items that define out days, everything else we do is fitted in around these items. There shouldn’t be too many items here. These are items like work, school, meals. These are the items we cannot go without doing, or would have a negative impact on our day or lives if they were missed. Maybe you have a baby or younger child at home who still naps, if so, nap times might be something you would put in this box, because they are an important, really shouldn’t miss them, part of your day. This category is for the things you need to do that directly relate to the items in Category 1. For example, school is in my Category 1, so in Category 2 I would put in items that relate to that. Getting myself and the boys ready in the morning, making breakfast, packing lunches, making sure homework gets done and is returned, and leaving the house on time, are all items that I would list in here. 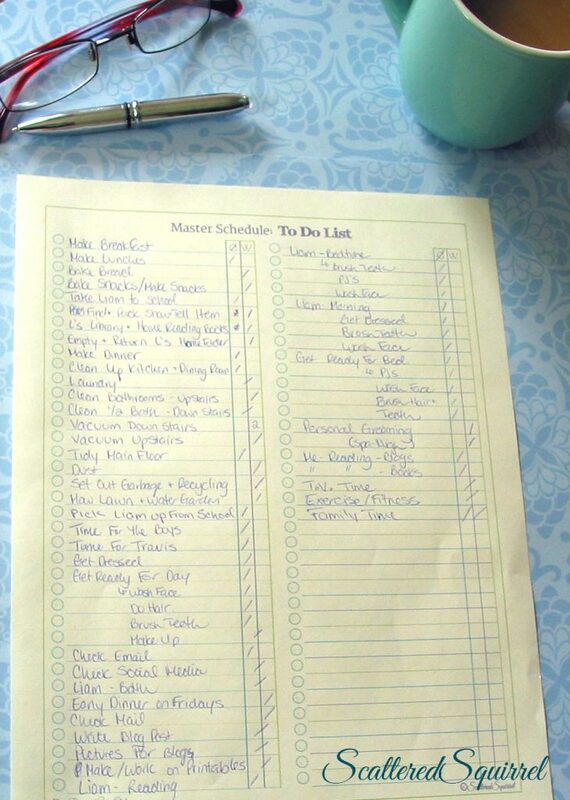 Here is where you put the rest of the items off your Master To Do list. This category is for everything else you need to do in a typical day or week. So, in here I have things like, time for reading, family day/night, (since we tend to fit one in once a week) and my house work items, fitness, and a little pamper time. Remember that I promised we would address the things that fell outside of a typical day or week? Well this is where we put them. This category is for things that you need to do outside for your typical week. Things like paying bills, buying groceries, seasonal cleaning, etc…. This is the fun stuff. This is all those little things you like to do, but maybe don’t always have time for. Or maybe you’re going to use this for once in a blue moon items. Basically, anything goes in this one. Already in here I have things like Christmas shopping, party planning, spa days, coffee with friends, window shopping, trip to Ikea (cause I still haven’t been, lol) little extras or items that don’t happen often. So there you have it. 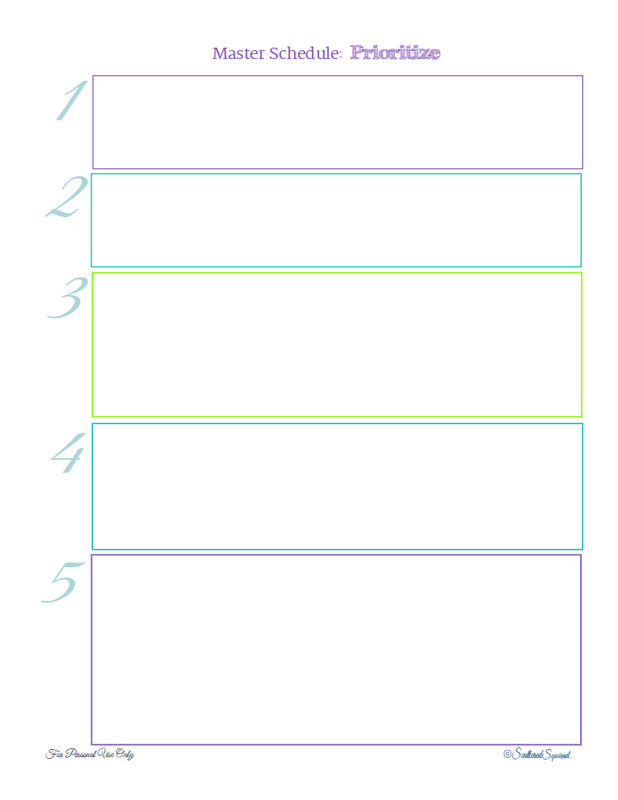 Step two is to take the list you made and prioritize it using the printable above. (just click the picture to snag a copy for yourself!) 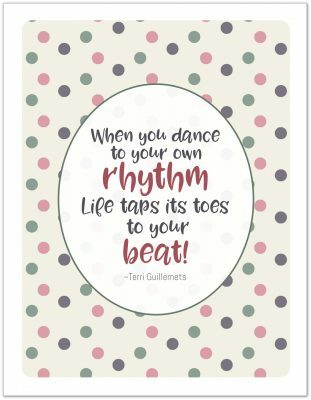 Have some fun with this, but also take some time to really think about what things dictate your days, it’s crucial to time management to acknowledge those things first so that you can make the most of the time around and between them. Next week I’ll share my next step, and I’ve also got an organizing project I can’t wait to share. Well, actually I can wait, I’m sort of dreading this one, my master closet. I haven’t don’t anything with it since we moved in, except for tossing stuff in it and hanging up our clothes. It’s in need of some serious TLC! What things do your days revolve around? Do you build your routines around those items, or do you just sort of go with the flow and somehow it all works out well? 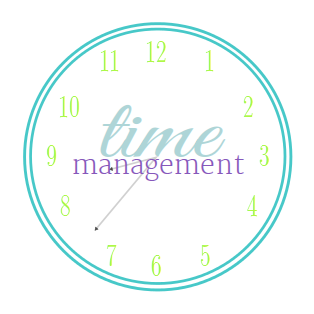 Previous Post: « Time Management: The List!